Hurricane Irma is moving north after leaving a wake of destruction in the Caribbean starting on Wednesday. While some islands were relatively spared, Antigua and Barbuda, St. Martin/St. Maarten, St. Barthemely, Anguilla, and the Virgin Islands were devastated. At least 13 deaths were reported as of 7 September, and that number is expected to rise. In areas affected by flooding, access to safe drinking water and sanitation is limited, and the risk of waterborne disease is increased. As many as 26 million people are expected to be affected by the hurricane, according to Red Cross estimates. Next in the storm’s path is Cuba and U.S. states of Florida, Georgia, and South Carolina. The most potent Atlantic Ocean hurricane ever recorded, the hurricane has had maximum sustained winds of 185 mph. Nazarenes on the Caribbean island of St. Martin/Sint Maarten were heavily affected as the storm hit the island with full force. Three Churches of the Nazarene in St. Martin were severely damaged by the catastrophic winds. A newly constructed church in Marigot, the capital city, was completely destroyed, and the Marigot Church of the Nazarene in Cripple Gate lost its roof and the contents of the building were damaged beyond repair. According to District Superintendent Daniel Blaise, 75 percent of church members lost their homes entirely. Food, water, and safe shelter are immediate needs. Inhabitants of all the islands hit now have extremely limited resources, little-to-no electricity, and are coping with flooding and huge losses. 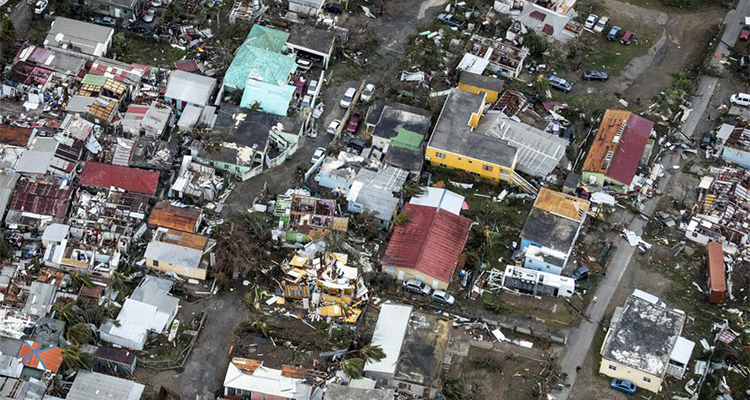 Pastor Jean Larevoir, who oversees the three Nazarene churches in St. Martin, said he is “so discouraged” because he sees people suffering but can’t do anything to help. The slow-moving storm continues to batter islands with strong winds and rains as it progresses. In the Dominican Republic, more than 5,000 people were displaced, and more than 1,000 homes were damaged or destroyed. Waterborne illness is a risk in flooded areas. Haiti was spared the full brunt of Irma, although heavier rains combined with mass deforestation in the country will increase the risk of mudslides and flash floods. Officials fear flooding could also create a cholera surge, which happened after Hurricane Matthew last year. As Irma continues cutting a path through the Atlantic, the hurricane is expected to hit southern Florida’s east coast — the most densely populated area in the state — hardest. The Church of the Nazarene’s Southern Florida District has established three main response bases at Fort Lauderdale Dayspring Church of the Nazarene, Lake Placid Camp and Conference Center, and Lehigh Acres Church of the Nazarene. Response teams are standing by to help clear damage after the storm. Church leaders in Georgia, South Carolina, and North Carolina are also mobilizing response efforts as they prepare for the storm. Please pray for those facing the devastation left in the wake of the hurricane and those who have lost homes and loved ones. Pray for the recovery of the places that have been hit hard and the swift delivery of the supplies and care they need. Pray for those who are bracing for the storm, asking that they will be kept safe and that supplies will last. Pray for those who are most vulnerable, especially senior adults, individuals with disabilities, and people living in poverty. Pray for church leaders and churches responding to the needs around them. To send a prayer or note of encouragement, go to ncm.org/pray. Churches and individuals around the world can provide support through the Emergency Relief – Hurricane Response Fund. Donations will be used for immediate needs, such as water and food, as well as long-term recovery and rebuilding efforts. For additional countries, give through your local church or district, designating your gift to Emergency Relief – Hurricane Response.